Trainer Danny O’Brien has confirmed that talented sprinter Shamexpress will take his place in the 2014 All Aged Stakes field at Royal Randwick on Saturday. Shamexpress started his autumn preparation back in February when he ran home strongly to finish second behind Snitzerland in the Group 1 Black Caviar Lightning Stakes (1000m) at Flemington and he performed consistently at Group 1 level in the Newmarket Handicap (4th), William Reid Stakes (5th)and T.J. Smith Stakes (7th). O’Brien told Racing Ahead this morning that he was happy with the way that Shamexpress finished the race in the T.J. Smith Stakes and said that he is hopeful the O’Reilly entire will be able to produce an even better performance on a drying track at Royal Randwick this weekend. "We have had a frustrating enough preparation with him," O’Brien said. 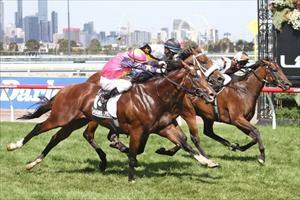 "Obviously he hasn’t won this prep, but he has raced very well for us and he is rock-hard fit. "It would be lovely to get back on a dry track there on Saturday and if it was going to be a heavy again or we drew poorly we probably wouldn’t go back up there, but the weather looks ok.
"He hit the line super from a long way back on a track that was hard to make up that sort of ground and he has come out of it really well." Shamexpress has previously had three race starts at 1400 metres, finishing fifth in the Group 2 Sires Produce Stakes behind All Too Hard in 2012 and ninth in the Group 1 2012 Golden Rose Stakes, but has not contested a race over the trip since he finished fifth behind Epaulette in the Group 3 Caulfield Guineas Prelude during the 2012 Spring Racing Carnival. O’Brien said that Shamexpress is unlikely to press on to Queensland for Doomben 10,000 or Stradbroke Handicap and is set to head to the spelling paddock after running in the All Aged Stakes on Saturday.